Every time that I review cleansing wipes I remind readers that I don't agree with wipes as a cleansing method yet I can't deny that they come into their own on those times when you're either travelling or too tired/ drunk to bother with a full cleanse. With party season rapidly approaching, it seems apt that today's review is of some cleansing wipes, namely the Korres Milk Proteins Cleansing & Makeup Removing Wipes. Korres offer two different cleansing wipes within their range- as well as the Milk Proteins wipes which are the focus of today's review, there's also a Pomegranate version aimed at oily & combination skin types. The Milk Proteins wipes are suitable for all skin types. Whilst I like the bold typographic design of the packaging (I believe that the wipes are being repackaged to a more plain, sleek design), I'd have preferred a clip rather than the sticker seal. I find clip fastenings to be more secure and given the low rate at which I use wipes, I find that those with sticker seals can dry out in between uses. The wipes have a fresh fragrance & felt refreshing to use. They're a drier wipe than others I've tried, which is a downside as I found that I needed to use more than one wipe to remove my makeup. What's more, I was concerned that the drier wipes combined with the simple sticker seal on the packaging would mean that they'd dry out quickly between uses. The fabric of the wipes appears to be quite strong- when I tried to tear them, they only ripped in one direction & that was with more force than they'd be put under in normal use. The wipes feel soft on the face. They are smooth on one side and textured on the other which made for a nice effect, although it didn't appear to serve any other purpose. I'm often unable to tolerate using wipes around my sensitive eyes so I was impressed that I didn't have any problems with these (& I noted afterwards that they are ophthalmologically tested) . A slight residue was left on my skin which didn't feel sticky or uncomfortable- it was just the right amount of product to ensure that my skin didn't feel tight after using the wipe but without feeling like a layer of product was sitting on my skin. 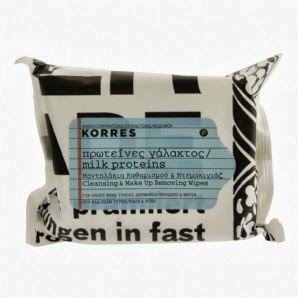 At £7 for 25 wipes, Korres Milk Proteins Cleansing & Makeup Removing Wipes are approximately twice the price of drugstore wipes, which I find hard to justify as there appears little to set them apart. For this reason, I wouldn't repurchase them- I much prefer the (more affordable) Good Things Total Wipeout wipes.